A great thing happened last weekend while driving to the plant nursery with my neighbor. We spotted a garage sale while rounding a curve (and talking too fast), so we decided to stop on our way back from the nursery adventure. We filled my car from front to back with plants, plants and more plants—hostas, phlox, ferns, pinks, creeping jenny and everything else we could cram into the back of an SUV. Wouldn’t you know those plants didn’t deter our need to stop at the garage sale … especially because I had eyed a wicker sofa and ‘J’ had spotted a set of outdoor dining chairs. 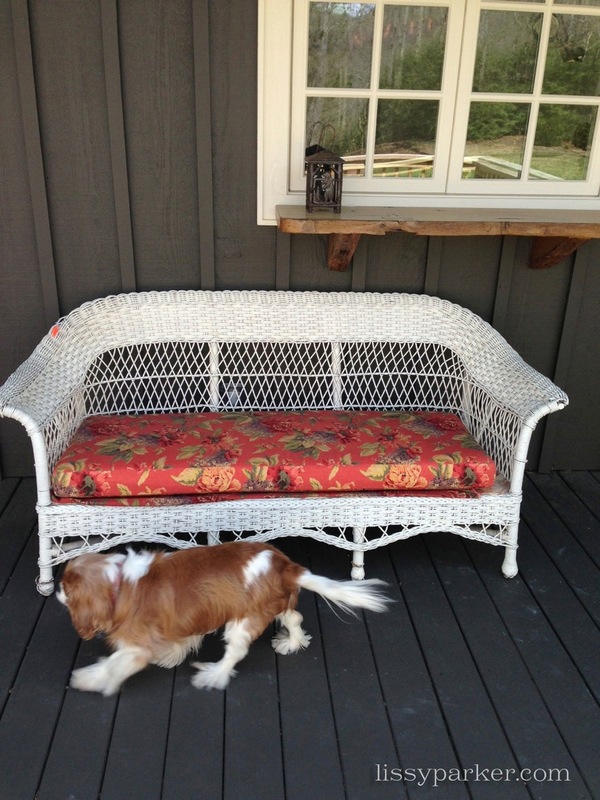 I struck gold that afternoon—an antique wicker sofa in almost perfect condition. ‘J’ wasn’t so lucky. The chairs of interest had the cushions permanently attached with no chance of recovering them—so they remained at the sale. The gentlemen were kind enough to follow me home in their pick-up and carry the sofa to my deck. I’ll update you soon on the color and the new cushion choices. I brake for garage sales! Very Pretty Lissy. Can’t wait to see the fabric you pick for the cushions! I am thinking red and white. You devil you! Love that and I know it is going to look amazing in your home! The beat dog in the world!